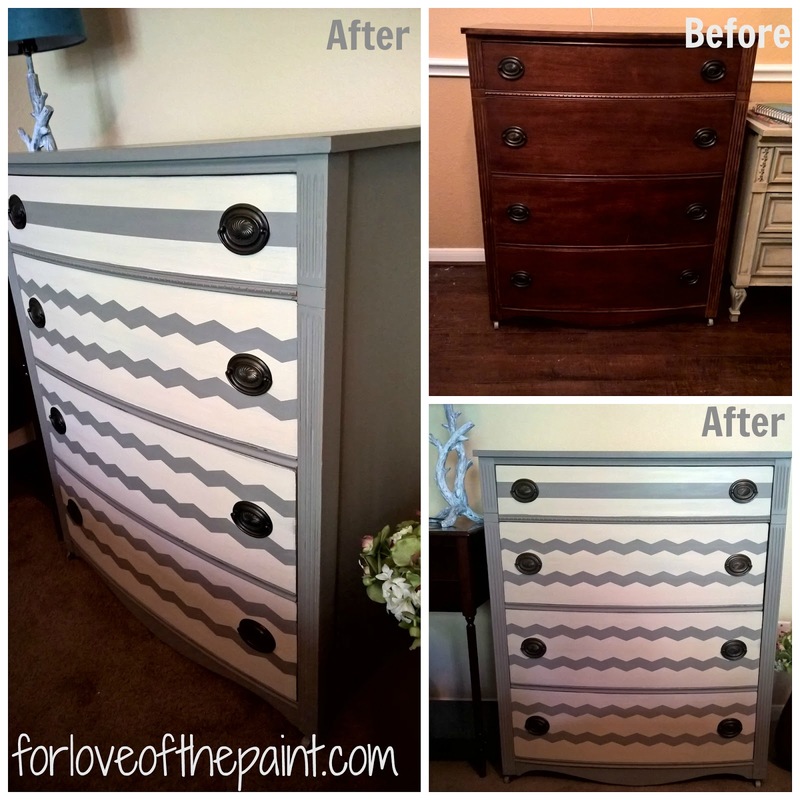 For Love of the Paint: Before and After: Vintage Chest of Drawers into Chic Chevron Accent Piece! 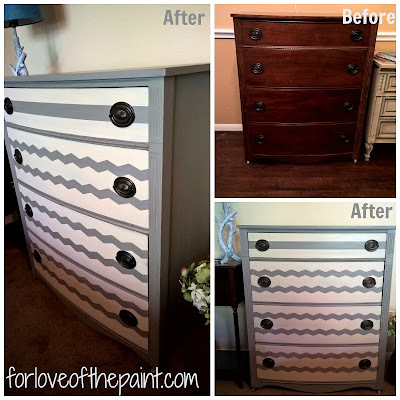 Before and After: Vintage Chest of Drawers into Chic Chevron Accent Piece! This dresser was so much fun to work on! 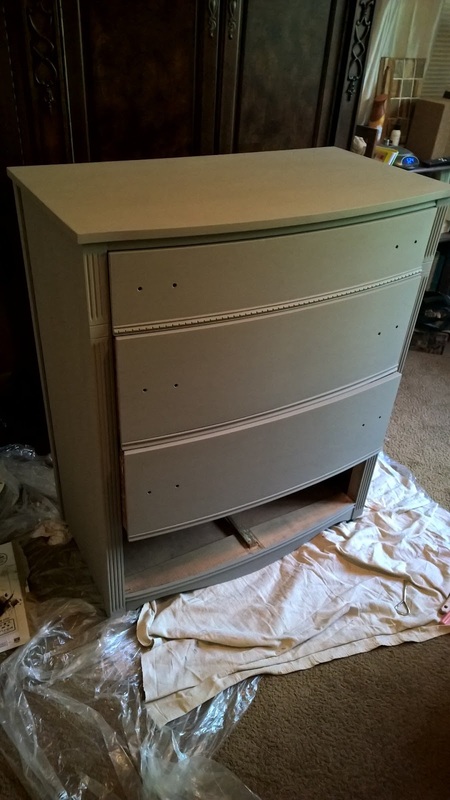 I started with a totally classic piece, and updated it with Annie Sloan Chalk Paint in French Linen, which is a lovely neutral gray with cool undertones. But I'd also done some late-night Amazon impulse shopping and came across Frog Tape's Shape Tape in Chevron, and was dying to try it out, so I decided to go bold on this refinish! My neighbor gifted me with some Old Ochre, so it seemed like the perfect opportunity to give that a test drive as well :)And I'm so glad I did! Here it was with just the French Linen - it would have been clean and classic once waxed, but I think it looks super chic and current with the chevron striping on the drawers! I just laid them out and made sure the ends of the tape were level before painting over with the Old Ochre. The top drawer is thinner, so I chose a straight stripe instead of having competing sizes of chevrons. Afterward I distressed all the edges and high points. Now I want to pattern everything! The Shape Tape was pretty easy to use, just make sure you focus on sealing the edges without rippling (I did this by starting in the center and gently pushing out toward the edges) and being slow and careful when removing the backing, and also when pulling off the tape.